You will love this traditionally-styled, private duplex. Modern luxury meets history with antique furniture, original brick walls, UHD flatscreen, modern kitchen and a top-tier mattress. 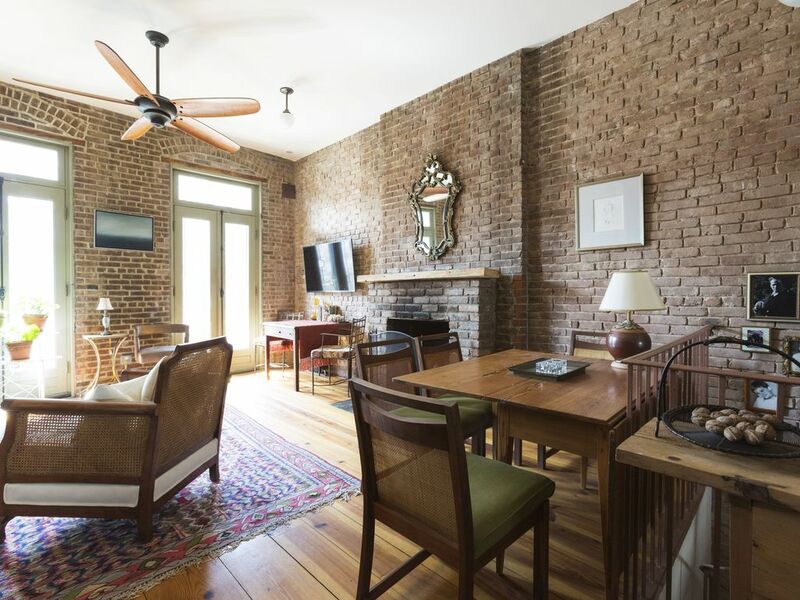 Enjoy 1.5 baths, a green garden, and a pet-friendly apartment. The apartment offers easy access to the entire City, one block from the subway, and the neighborhood is host to some of the best restaurants in the City. Harlem is its own microcosm within New York and could be explored for days without seeing it all, especially with a huge popularity boost in the past 10 years. Celebrity chefs like Marcus Samuelsson have opened globally-known restaurants like Red Rooster, known for its jazz brunch, fusions of Southern staples and downstairs performance space Ginny’s Supper Club. Meanwhile, new shops, music venues and ethnic-centric museums make the neighborhood endlessly interesting. The National Jazz Museum pairs live performances with discussions. You can also learn more about Puerto Rican, Latin American and Caribbean culture and history at El Museo del Barrio. The Studio Museum of Harlem is known for work by African-American artists and pieces representing the African diaspora and original works from Africa. Film festivals and workshops are also featured at Maysles Cinema while old-school jazz bars and speakeasy-style bars can be found nearby like Minton’s, Showmans Jazz Club and Cotton Club, where 1920’s-style big-bands can be heard. We love to indulge with soul-food at Billie’s Black and Miss Mamie’s Spoonbread Too. Cajun and creole dishes can also be tried at Londel’s Supper Club, po’boys at Harlem Food Bar and French fare at Chez Lucienne. You can start or end the evening with state-of-the-art cocktails at 67 Orange Street before or after a show at the 80-year-old Apollo Theater. The Abyssinian Baptist Church, brownstones and parks like St. Nicholas and Marcus Garvey Park also make wandering around outdoors a gorgeous adventure on any day. My apartment is centrally located with easy access to the Subway. Cabs and Ubers are also plentiful, and it's a safe neighborhood to walk, day or night. JFK (John F. Kennedy Airport) is located outside of Manhattan and is around an 1 hour 15 min car ride or 1 hour 15 min subway/train ride. NWK (Newark Liberty International Airport) is located in New Jersey and is around an 1 hour and 15 minute car ride or 1 hour and 15 min subway/train ride. Laguardia Airport is located near Manhattan and is around a 45 minute car ride or an 1 hour min subway/train ride. We have a full kitchen with all the things you need to prepare a nice meal. Excellent apartment - perfect in every respect! My stay in this lovely and comfortable apartment was perfect. The flat exceeded my expectations - very spacious, lovely furniture, extremely convenient with a subway line at the end of the street. James is the ideal host making himself available at the appropriate time with helpful tips and guidance about the neighborhood. I will definitely be booking this apartment on my return to New York. Thank you James for a wonderful visit. The apartment is exactly as shown on the website. Very clean, quiet, warm and comfortable. We had a warm welcome from James who was most helpful throughout our visit. Great location in Striver's Row. Big, clean and well fitted apt. Close to the B and C trains. Quiet. Close to good restaurants. Highly recommend. Very homey and relaxing!!! James is a wonderful host. Truly wants you to be comfortable. Was a great place to come back to after a long exhausting day! Loved the decor!! Close to trains downtown and very quiet in the neighborhood. Very easy to navigate! Comfortable, quiet, secure, well-equipped. All-in-all - OUTSTANDING! Communications with owner and his on-site rep were clear and prompt from pre-arrival to checkout. Rep met us at property and explained operation. Very courteous, very professional. Beautiful furnishings, comfortable, clean, fully equipped. Close to NYC bus lines and grocery and deli and drug store. Quiet all day and night. This is truly an outstanding property. James is a delightful and pleasant host, warm and cosy space - much larger than you think. Short walk to the subway. Would definitely stay again!